The Huskers' full 2018-19 conference schedule has been released, meaning the entire slate is set. A 29-game regular-season schedule will feature 18 games against teams that qualified for postseason play in 2018, including 12 games against 2018 NCAA Tournament teams. The season opens with an exhibition (Nov. 3) against a Nebraska-Kearney team that won 21 games a season ago. The regular season begins at home against 2018 NCAA Tournament qualifier and Missouri Valley Conference champion Drake on Nov. 7. After losing to Nebraska in Des Moines last season in double-overtime, Drake won 21 consecutive games en route to its NCAA Tournament bid. The Huskers will also face one of last season's NCAA Women’s Final Four participants in Louisville on Nov. 29 as part of the ACC/Big Ten Challenge, a fourth consecutive road game. The Huskers went 9-2 away from home last season. A return to Pinnacle Bank Arena for the team's longest home stretch of the season will bring Kansas (Dec. 5), San Jose State (Dec. 8) and Denver (Dec. 15) before a trip to Arkansas (Dec. 18) closes out nonconference play. In Big Ten play, Nebraska has double-dips with Michigan (home on Dec. 28, away on Feb. 7), Iowa (away on Jan. 3, home on Feb. 25), Maryland (home on Jan. 8, away on Feb. 14), Northwestern (home on Jan. 24, away on Feb. 21) and Purdue (away on Jan. 31, home on Feb. 10). Nebraska’s first four games in the league will be against top-six finishers from the final 2018 Big Ten standings, including a trip to defending regular-season and tournament champion Ohio State on Dec. 31. Senior Night will be Feb. 25 against Iowa (the men also close their season at home against Iowa) and the Huskers' regular-season finale is March 2 on the road against Penn State. The 2019 Big Ten Tournament in Indianapolis runs from March 6-10. 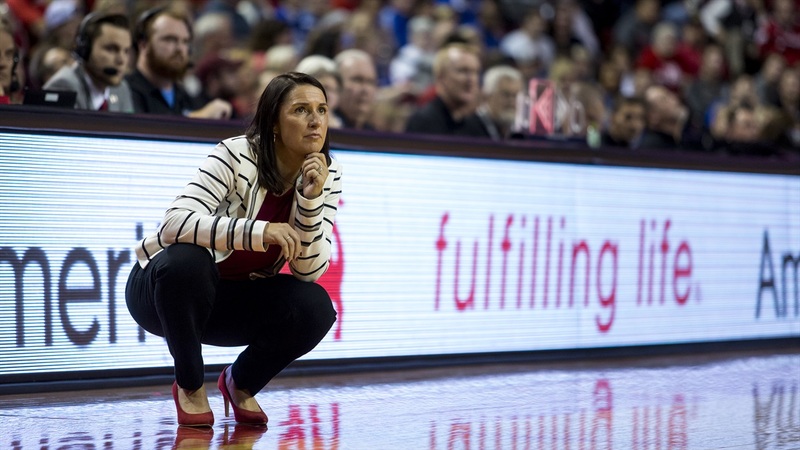 Last season, Nebraska posted the nation’s top turnaround in its second season under Big Ten Coach of the Year Amy Williams. The team returns four starters and each of its top five scorers from last year's NCAA Tournament squad. Single-game reserved tickets for Nebraska’s 15 home contests (14 regular season games, one exhibition) will be $15 per game. Season tickets go on sale on Aug. 22 at 10 a.m. CT and can be found here.